Click the desired button below to download self evaluations included in my book, The Guide to Gusto: 20 Ways to Learn, Love & Leverage Yourself to Unlock a Life of Happiness, Purpose & Productivity. Please consider joining my email list to receive weekly self-discovery strategies, education, and updates. Thank you! Please click HERE to download your complete Gusto Self Evaluations Workbook. To download individual evaluations, please click the button below. Over 500 words and phrases to help you find what resonates with you. Identify what word or words light you up and utilize them to help you stay focused, find clarity, and make progress toward who and where you want to be. Our bodies LOVE routine. But what does it take to build a routine or rhythm that energizes, empowers and brings us joy each morning? This four page worksheet guide will help you build your own amazing morning routine and get the most of your days. You'll feel happier, work smoother, and be more productive...see what is in your ideal routine! 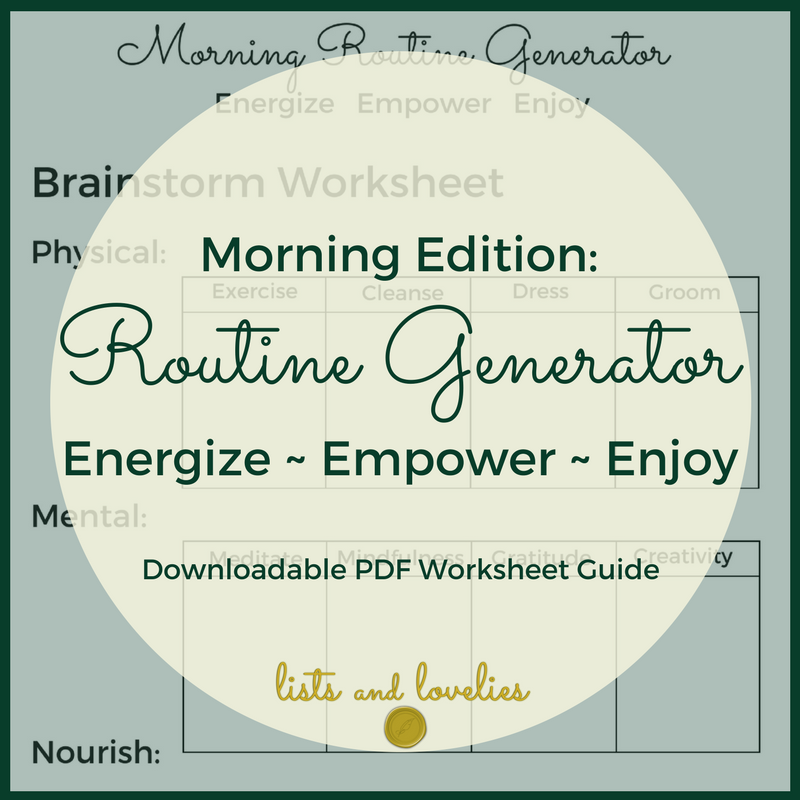 Click below to download the free worksheet guide and to read the article all about the key elements of an empowering and energizing morning routine. By checking this box, you will be added to our email list and receive updates and news weekly. Thank you so much for choosing to download this worksheet guide and plan your own amazing morning routine. You can click here to download now. And oh yeah...you are fantastic! Have an awesome day! Your body and brain work hard every day to bring you productivity, happiness, positivity, movement and a whole host of other amazing feats. But do you reward them with time to relax, unwind, and settle in for sleep at the end of the day? Learn how to build your own restorative evening routine and what you can include to make it the ultimate experience. Click below to download the free worksheet guide and to read the article all about the benefits and elements of a rounded evening routine. Thank you for your interest in building your own evening routine. Your passion for excellence amazes me! Click here to download your free PDF. And happy building! Releasing hustle tendencies. We all have been taught to go, go, go! But what happens when we slow down, become mindful, and realize the things in life that bring us true daily joy? This evaluation helps you notice the rushed, stressed, or tense moments in your life and learn to embrace a slower, more peaceful way of living. Click below to download the free worksheet and to read the article all about the slow living movement and the harshness of hustle in our society. Thank you! I am so pleased you are interested in learning to live slow and release the hustle. Click here to download your free pdf worksheet. Click below to download the free worksheet and to read the article that explains the book it is adapted from! Thank you for your interest in my worksheet! You can download your Know Yourself: Self Evaluation pdf here. Where do YOU work best? What type of space brings you joy, purpose, and focus? For many, a typical office just doesn't cut it. Take time to discover more about yourself and learn how you can adjust where you work to live a life of more productivity, increased happiness, and overall positivity. Click below to download this FREE evaluation and to read the article all about how to find your own ideal workspace for productivity and happiness. Thank you for downloading your Ideal Workspace and Location Evaluation. You can click here to access it. And don't forget to pop around and see what other free downloads may help you feel happier and more productive! Have you experienced the glorious state of flow? If so, you know the drive to reach that state as much as possible. If not, you can work to find your own unique flow by evaluating your own effortlessness and difficulty. This worksheet helps you do just that. Take note of how you are working and feeling and find ways to reach your flow state more often! Click below to download the free worksheet and to read the article all about finding your own flow in a balance between chaos and control. Thank you SO much for your interest in finding your very own flow. Click here to download your free pdf worksheet. Goal setting is fantastic...but we can easily get carried away into a life of intense control and limited flexibility. This checklist will help you plan and stay on track to set realistic goals that YOU are truly passionate about and commit to staying flexible and happily re-evaluating your goals on a regular basis. Click below to download or to read the article about how to best use this tool! Thank you for staying up to date with our lists and of course, the lovelies as well. 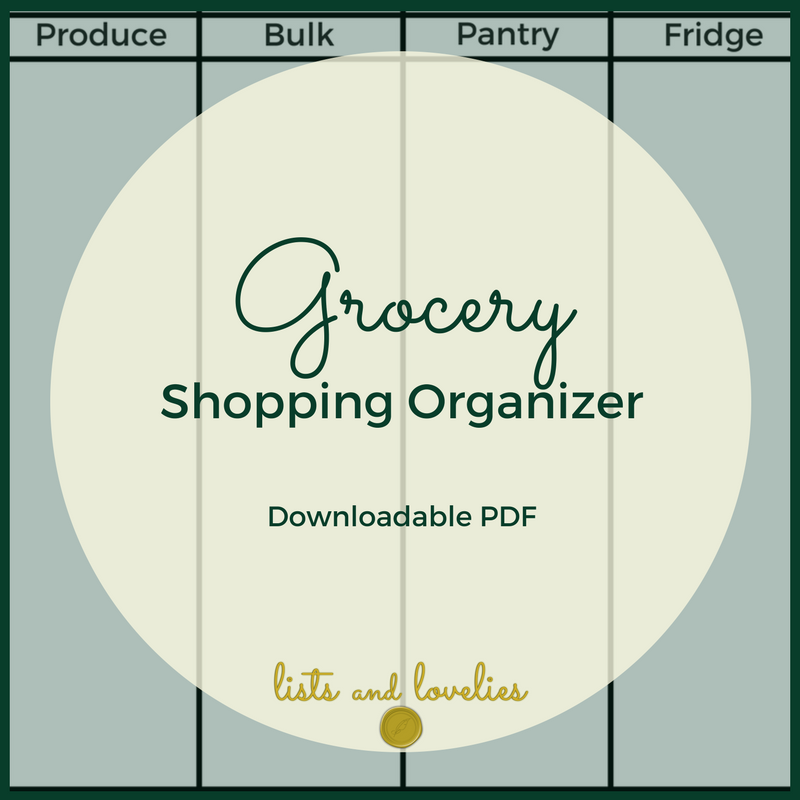 You can download your free printable checklist here. What is your current passion project? Have you been avoiding taking the next step due to fear or perfectionism? This worksheet helps you revisit why you are passionate about the work and realize the true joy you can experience when you embrace vulnerability and share your work with others. If not now, when?! Click below to download the free worksheet and to read the article that explains this and other self inspiration tips! Thank you so much for committing to your own happiness. Click here to download your worksheet. Personal Finance can often seem like a tricky and overwhelming concept. I've found that being proactive and mindful of it leads to the best success and least amount of stress. 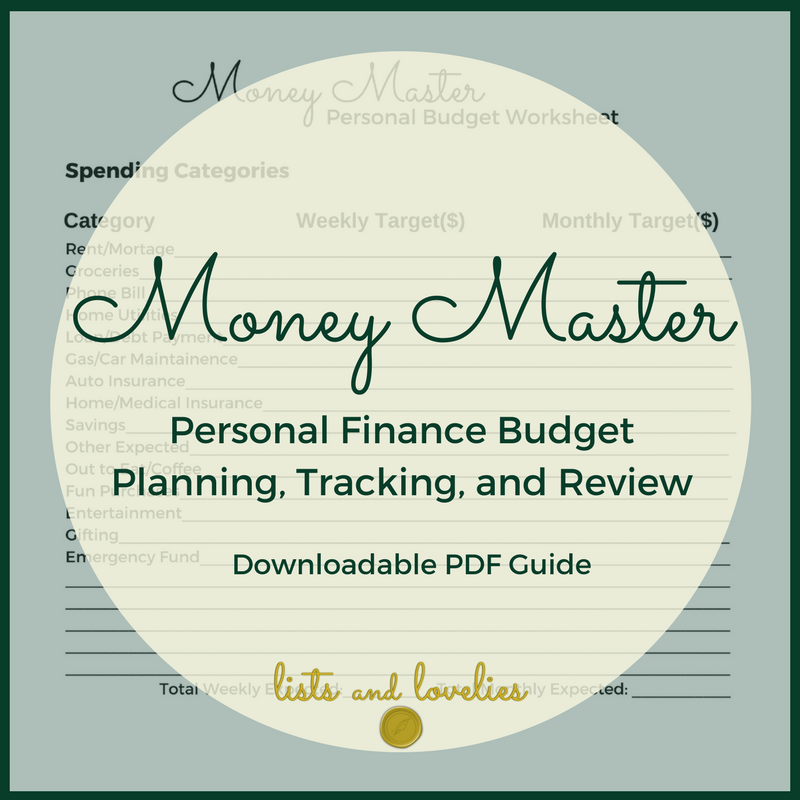 This resource includes 3 parts, budget planning, tracking your spending, and reviewing your week or month opposite your goals. Click below to download this forever useful tool. Article about how to best utilize it coming soon! Thank you, lovely! You can now access the download here! The holidays don't have to be a time of stress, anxiety and dismay. Use this insightful Graceful Gifting Planner to get your thoughts, budget, and amazing ideas in order for everyone you care about...all while preserving and expanding your holiday cheer and happiness this season. And a checklist is always fun, too! Click below to download this tool for Free and to check out an article about how to best use it (in 4 steps). I am so pleased you have chosen to use my Graceful Gifting Planner! A smooth and wonderful holiday season is coming your way. Click here to download the resource. Planning healthy and delicious meals doesn't have to be incredibly time consuming. This biweekly meal planner helps you organize your thoughts, plan your meals, and release the stress and worry that so often go along with getting food on the table each day for those you love. Thank you, lovely! Your download can now be accessed by clicking here! Ever feel like your weeks are crazy busy but you still can't get the things that are important to you done? It's time to optimize your own individual productivity and efficiency and make your weeks smoother, more in flow, and happier all at once with this weekly planner developed from years of experience. Thank you! You can download the planner by clicking here! A to-do list can seem extremely overwhelming and disheartening at times. That's exactly why I've created a To Conquer List just for you. This list empowers you to take action and stay organized in order to get things done in the most efficient way...and preserve your sanity in the process. Leverage your for your best productivity...starting now! Click below to download the resource for Free and to view an article about how to best use this tool. Yes! You are ready to take your own individual productivity and happiness to a new amazing level. Click here to download your To Conquer List. Get ahead of your holiday stressors and use this packing list full of essentials and holiday reminders to stay organized. Not only will it remind you of the basic travel items needed for any trip, but it will also help you keep those holiday extras in mind and make sure you leave home prepared and set for some holiday cheer! Click below to download the free tool and to read the article that explains this and other holiday travel tips! Awesome! You are TOTALLY going to be on track to conquer this holiday with style and truly make it the happiest time of the year! Download your checklist here. I've been hard at work putting together a lovely and useful book to help you self-discover how to life a life of great enthusiasm...or GUSTO! You will learn, love, and leverage your most productive and efficient talents and tendencies, develop new productive and organized habits, and have fun embracing and boosting your overall happiness. I'm proud to say the book is now available! Click below to learn more about the book and to find your best way to order! Do you ever feel like you are living less than your potential? Do you have this dream of who you want to be and how you want to feel each day? I did to. That is the entire reason I created this online course. Your potential best-self is not far away! They are lurking under the surface of who you are now, just waiting for their time to shine and thrive. Unlock and Embrace Your Own Compassionate Confidence helps you access this inner Compassionate Confidence and gives you practical and action-oriented tasks and tools to help you tap into and take full advantage of your inner badass in just 7 days. Click below to learn a heck of a lot more about this awesome course and how you can get started! I'm proud to offer coaching at a VERY affordable price. Click below to learn more and access my contact information.